Getting straight to the point may be the best way to handle conversation, but it’s not the ideal way to sharpen a knife. Knives are invaluable tools around the kitchen and other areas of the home, but if they aren’t sharp, they are useless – and dangerous. 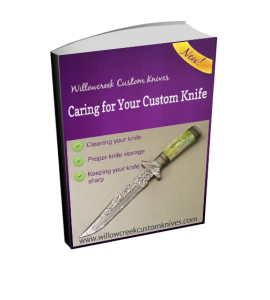 Whether you buy expensive knives or cheap knives, they all get dull with use. You can have your knives serviced by a professional, or you can learn how to sharpen your knives yourself. A word of caution: learning to sharpen your knives takes time and practice; don’t begin by trying to sharpen your best knives on your own as you could damage the blades. Although your knives may seem sharp, a practical test can tell you whether your knives need to be sharpened. Slice a ripe tomato – if you can slice the tomato easily, you’re knife is sharp; if the tomato squishes down and is difficult to slice, then it is time to add your knife to the ‘to-be-sharpened’ drawer. Knife blades are essentially tiny saws, complete with teeth. With use, these teeth get worn, bent or twisted. Knives made of harder metal don’t get dull as often as those made of soft metal, but when they do get dull, they are more difficult to sharpen. It is necessary to find a substance harder than what your knife is made of to sharpen that knife. Metal sharpeners called steels are often used by professionals like butchers, but for most people who own stainless steel knives, a ceramic sharpener may be a better choice.